Botox®, manufactured by Allergan, was the first botulinum toxin to gain a cosmetic licence endorsing its use for glabellar lines and wrinkles in the US in 2002. It was also eventually licenced for this use in the U.K. in March 2006 under the new brand name of Vistabel® (with a vial dose specific to treat glabellar lines) and was the first brand of botulinum toxin to receive a license for cosmetic use in this country. Although Botox® is still readily available and used by many UK cosmetic clinics, Vistabel® (although identical in formulation to Botox) is technically the first brand of botulinum toxin type A licensed for cosmetic use in the UK. Vistabel® is made from purified type - A neurotoxin produced by the bacteria Clostridium botulinum. How does Vistabel ® work? It temporarily prevents the release of acetycholine from sympathetic nerve terminals. To learn in detail how Vistabel® injections work, please click on Botulinum Toxin Treatment FAQ. Who can perform Vistabel® treatment? In March 2006, Vistabel® was granted a licence in the UK from the Medicines and Healthcare products Regulatory Agency (MHRA) for the "temporary improvement in the appearance of moderate to severe glabellar lines (vertical `frown` lines between the eyebrows) in adult women and men aged 65 and younger, when the severity of these lines has a psychological impact for the patient" . Who should not have Vistabel® treatment? Click on Botulinum Toxin Side Effects to learn more about the risks or side effects associated with Vistabel®. 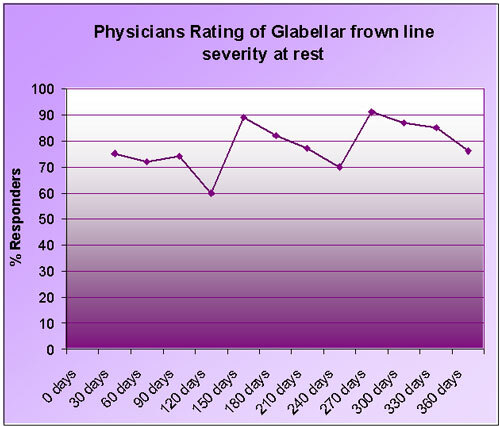 Most clinics and practitioners charge by area of the face treated, such as the glabellar lines (frown lines between the eyes). Practitioners may charge from around £175 - £300 per treatment. 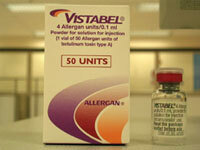 Vistabel ® is a registered trademarks of Allergan Inc.
Click for ALL Vistabel ® clinics in the UK & Ireland registered and verified by Consulting Room.